To use a sunvisor, pull it downward. 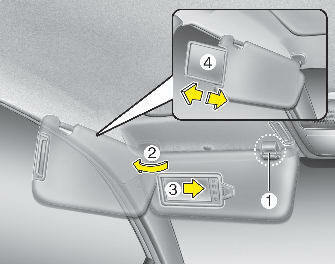 To use a sunvisor for a side window, pull it downward, unsnap it from the bracket (1) and swing it to the side (2). To use the vanity mirror, pull down the visor and slide the mirror cover (3). Adjust the sunvisor extension (if equipped) forward or backward (4).